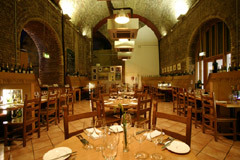 Cantina Vinopolis is located under the cavernous railway arches of the South Bank. It offers a theatrical environment in which to enjoy the fresh produce of the nearby Borough market creating a unique seasonal menu and daily specials. Cantina Vinopolis is loved by the South bank locals and is famous for its enormous award winning wine list. Due to the unique design of the dining rooms Cantina Vinopolis has the ability to cater for large parties whilst not disturbing the intimate and romantic diners elsewhere. The Blue Bar is the recent addition to this successful restaurant and has become so popular for customers, that the chef has designed a selection of oriental style dishes to enjoy whilst sampling traditional and innovative cocktails, executed to perfection by the charming mixologists. The restaurant organises private wine tasting, wine challenges, cocktail receptions and other tailor made events. Mediterranean cuisine inspired by many different myriads of culture including French, Italians, Algerian and Moroccan influence.